Many of you reached out to Daily Finance earlier this week after we ran a report on long-term unemployment's impact on older workers. Readers shared stories of careers terminated, benefits exhausted, and savings consumed. One couple spent their entire retirement fund trying to save their home, which they lost anyway. An out-of-work engineer wrote of his wife, who helps supplement their reverse mortgage, IRA and 401(k) by working part-time as a registered nurse for the maker of an injectable multiple sclerosis treatment. No doubt today's news about slight improvements in the unemployment rate bring little relief. The Labor Department's monthly jobs report showed that American companies added 80,000 jobs in October, 10,000-15,000 shy of economists' expectations, and the smallest increase in four months. Overall, the unemployment rate fell to 9 percent from September's 9.1 percent -- the first improvement since July. October's mediocre growth is barely enough to keep pace with population growth and twice as many jobs are needed to significantly lower the unemployment rate. Total payroll employment is now back to the level of July 2004, according to The Wall Street Journal's David M. Wessel. Still, of the 8.8 million jobs lost in the recession, only a quarter have been regained so far. One Daily Finance reader, a midwesterner named Steve -- who asked that his last name not be used, since he's still looking for work -- said that unemployment figures from the federal government do not reflect the true depth of the problem. "I know a lot of people who have exhausted their 99 weeks of unemployment benefits. Are they still part of the number?" Technically yes, if they're still looking, but the truth is that many have given up, as emails from other readers attest. Steve's previous position was as an executive at a staffing company. "There have been few jobs at my level," he said. "Recently, two opportunities were filled with internal promotions." Now, fed up, he's thinking of starting his own business. Steve said his new venture would be in his old field, placing temporary workers. "That's an industry that's growing, because people don't want to hire full-time workers. The problem with starting a business is, it requires capital, and it's hard to borrow money today." Steve summarized, grimly, "The over-50 group is just getting killed." Of course, it's likely that more older people, with lifetimes of toil behind them, have given up looking for work and are thus no longer counted among the unemployed. And, as the Pew Charitable Trusts reported earlier this week, long-term unemployment has impacted older workers more than younger ones. 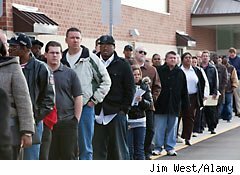 CNN reports that roughly 13.9 million Americans remained unemployed in October, and another 2.6 million were counted as "marginally attached" to the workforce -- they "wanted and were available for work, and had looked for a job sometime in the last year, but were not counted in the unemployment figures because they weren't actively searching for a job in October." The so-called underemployment rate, which includes the marginally attached as well as part-time workers who want full-time positions, fell to 16.2%.